The ruling Democratic Party of Korea said Thursday it will push for a parliamentary hearing on the unannounced introduction of additional THAAD batteries here, while opposition parties accused the presidential office of dereliction of duty and ulterior motives. The Terminal High Altitude Area Defense system was at the center of new controversy Tuesday when the presidential office confirmed that four launchers, in addition to the two deployed in Seongju, North Gyeongsang Province, had been brought into the country. In disclosing the information, the presidential office revealed that the Ministry of National Defense and the Park Geun-hye administration’s national security advisers had not relayed the information. Accusing the Defense Ministry of hiding information, the Democratic Party vowed a thorough investigation through the proposed hearing. The party is said to be considering putting Minister of National Defense Han Min-koo, Minister of Foreign Affairs Yun Byung-se and former National Security Council chief Kim Kwan-jin on the stand. The committee’s chief, Rep. Shim Jae-kwon, said that the committee did not discuss the issue with the presidential office and the party, but he believes President Moon Jae-in and party leaders would share similar views. Regarding the timing of the hearing, Shim said that the committee hopes to open the hearing at the earliest possible date, but added it would be unlikely during the June parliamentary session. On Wednesday, the presidential office announced that its probe into the issue determined that the Defense Ministry deliberately omitted related information in briefing the new administration on May 26. According to Cheong Wa Dae, the Defense Ministry’s draft report included the phrases “six launchers” and “stored at a camp” that were later deleted. The probe also found that the defense minister indirectly denied knowledge of the matter when questioned by National Security Council chief Chung Eui-yong on Sunday. Han has since denied any involvement in the process of the report being compiled and said that Chung may have misunderstood him during their conversation. Meanwhile, the main opposition Liberty Korea Party is attempting to turn the issue against the presidential office and the ruling party. Speaking to reporters at the National Assembly, Liberty Korea Party Floor Leader Rep. Chung Woo-taik said that the Defense Ministry and Cheong Wa Dae engaging in a game of truth was “comedy” and that the ruling party was making a rash move. “(A parliamentary hearing) is not under consideration. (The ruling party) is acting inappropriately, (a parliamentary hearing) could reveal state secrets and damage Korea-US alliance,” Chung said. The People’s Party went a step further, accusing the administration of incompetence and of attempting to use the issue to cover political issues. 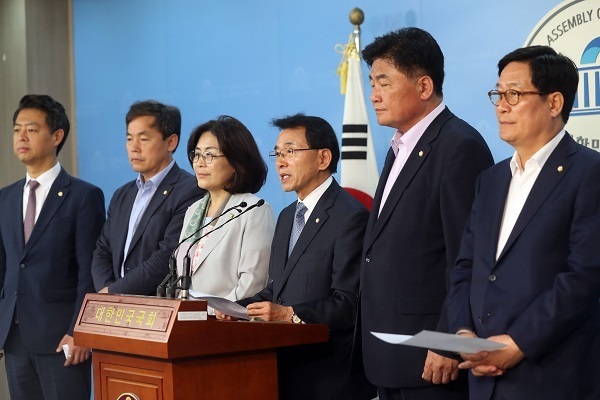 “Raising a fuss over issues that have been reported by the media shows the Moon Jae-in administration’s incompetence,” said Rep. Park Joo-sun, the interim leader of the People’s Party.